In this month’s issue of Clean Eating Magazine, they included a delicious recipe made with coconut oil! 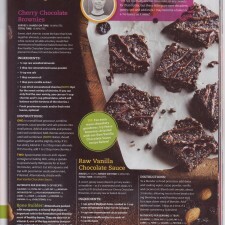 The recipe was for Cherry Chocolate Brownies with a Raw Vanilla Chocolate Sauce; my mouth is drooling from just the name. The best thing about this recipe is that it is simple and there is no required baking. It is also gluten-free and vegan-friendly. In a small food processor, combine almonds, cacao powder and salt; process into small pieces. Add oil and vanilla and process until well combined. Add cherries and process until well combined. Spoon batter into a 6-inch square container or baking dish, using a spatula to spread evenly. Refrigerate for at least 30 minutes, until set. In a blender or food processor, add dates and soaking water, cacao powder vanilla and coconut oil. Blend until smooth, about 3 minutes. Drizzle the tops of the brownies with the chocolate sauce and serve! This recipe is a thumbs up in my house because I feel like I never have the time to bake any decadent desserts. If you don’t like cherries, try substituting them with a favorite dried fruit of your choice. I think I would choose to add pomegranate to this chocolaty creation. Try making Jen’s Brownies with Peanut Butter Chips for another delicious brownie recipe! Would you try these brownies? Let us know by leaving a comment below! Thank you for sharing this information. Coconut oil is widely for cooking in southern states of India mainly Kerala. Coconut oil is considered as the best cooking oil and it is said that it is rich in Vitamin A and Vitamin E.
You’re very welcome! We are happy that coconut oil is not only common to use in the states but also around the world! Coconut oil has many nutritional benefits and also tastes delicious. What is your favorite dish to make with coconut oil?